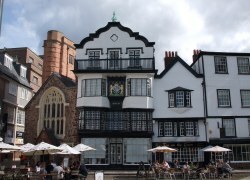 Although many of Exeter's historical buildings were destroyed and others damaged in the second world war, there are still numerous notable buildings remaining. 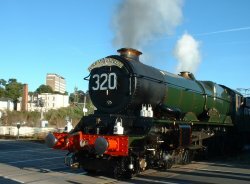 As well as the wealth of the splendid examples of period architecture on fine display around the Cathedral close, a selection of other important landmarks that makes Exeter rich in history and heritage are shown below. Rougemont Gardens are set below the castle walls where part of the moat once lay. Although now dry, it is easily identified by the dip in the landscape's contour. Following a footpath to the higher end of the gardens will eventually lead you to a gate in the wall. Upon passing through this gate you will arrive in the beautiful gardens of Northernhay. These gardens are believed to be the first designated public gardens to be laid in the country. The construction of the castle was started in 1068 under the instruction of William the Conqueror. For years the castle's yard was used as a place in which people could gather. These meetings were no longer possible after the county court was built in 1774 and occupied the inner part of the castle. The court moved to a new site in 2004 leaving this great historic castle under new ownership. Now that the court has moved to new building, the castle and yard has started being used again for functions and festivals. During the 2nd century the Roman Legions started constructing the city walls to help with its defences. The building work continued through the Dark Ages with the citys' occupying defenders adding to the Roman foundations. Although parts of the wall have been repaired and rebuilt since the original construction, large sections of the Roman and medieval wall still stand today. The Redcoat Guides offer a walking tours of the city wall. 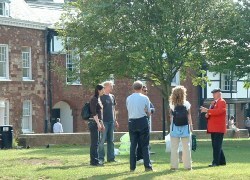 For more details on this walk and other tours available visit the Things to Do in Exeter page!